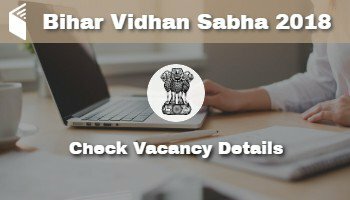 Short Information : Bihar Vidhan Sabha (BVS), Government of Bihar Are Recently Upload Exam Date/ Mock Test Online for the Post of Junior Clerk, Assistant, Librarian Assistant, Translator, Urdu Assistant, Urdu Translator, Translator (English/Hindi) & Assistant (Research/Reference) Recruitment 2018. All Registered Candidate Can Check Exam Date/ Use Online Mock Test Now in The Given Link Below..
Assistant 29 09 01 13 – 02 2* 17* 54 Graduation pass from a recognized university. Assistant (Research/Reference) 04 01 – 02 01 – – 02 08 Bachelor Degree in Library Science with Post Graduate in any subject from a recognized university. Library Assistant 05 02 – 02 01 – – 04 10 Bachelor Degree in Library Science with Post Graduate in any subject from a recognized university. Urdu Assistant – 01 – 01 – – – – 02 Bachelor Degree with Urdu should be a subject of language in the Graduation from a recognized university. Urdu Translator 01 01 – – – – – – 02 Bachelor Degree In Urdu with Hindi should be a subject of language in the Graduation OR Bachelor Degree In Hindi with Urdu should be a subject of language in the Graduation from a recognized university. Assistant Caretaker 03 01 – 01 01 – – – 06 Graduation pass from a recognized university. Junior Clerk 09 03 – 03 01 01 – 06* 17 10+2 (Intermediate) pass from a recognized board. Conclusion : For more detailed info regarding toBihar Vidhan Sabha Sachivalaya Various Post Mock Test Online 2018 kindly visit official website and read carefully employment advertisement before applying against to Bihar Latest Bharti 2018. Subscribe Careerresult to get latest updates about Bihar Legislative Assembly Secretariat Various Post Recruitment 2018 on your smartphone via E-mail. For more latest jobs updates in Bihar Stay connected with us.All candidates have to request is to share this job link with your friends over at Whats App, Facebook ,Twitter,Instagram and help them get good career in your life.